It was cold in the river canyon at Whistler's Bend on the North Umpqua. Here, the fishermen and shuttle drivers gathered in preparation for the day's runs. Some would run the upper section. We would drift from Whistler's down to the dam. It is a section of river a lot of boaters avoid. The first rapids out of the launch consist of several hundred yards of ribboned river, channelized in wicked ledges between patches of willows between the banks. Around the corner, the boater faces another rock garden. And the stories of boats claimed by the river are legion. We do this for a chance to match wits with winter steelhead. Every time I run the Umpqua, I remember that it is this river system where I caught my biggest steelhead, my biggest chinook, my biggest smallmouth bass. Any given day it could happen again. "Jousting for steelhead in the willows," Curtis Palmer said. Our steed was a 16-foot Pavati drift boat named Sparkles. Palmer's company is River Secrets Guide Service (541-670-9451). This was my first time in his boat and we were joined by outdoor writer and fishing guide Bill Kremers from Corvallis. We never lacked for conversation. When he wasn't talking to us, he spoke to the river, to the steelhead, to the 8-horse Yamaha or Sparkles. He coaxed Sparkles as we squeezed between some rocks to set up to side-drift our second run. "I love you pretty girl, skinny girl." Up front Palmer had at least a half-dozen varieties of egg cures in various shades of red and orange. We drifted eggs with puff balls, alternating colors. Kremers opted for a chartreuse puff ball and red eggs. He was rewarded on the second drift with a grab and a fish that streaked away and cart-wheeled in the willows. Just when we thought we might get to net the fish, Bill's line went slack and the fish was gone. Side-drifting technique lends itself to light lines and Palmer prefers long noodle rods and six-pound test fluorocarbon, lighter than most guys use in the winter. For years I fished noodle rods and light line; it was fun to do it again. We lined up for the next rock garden and Palmer slipped Sparkles into the tongue of a narrow chute. The water had a green tint in the morning light. Any one of these channels could hold fish between the little islands, the boulders, the patches of willows. Palmer held the boat slower than the top current, our weights ticked bottom, the baits, on long leaders slipped through pods of unseen fish. Through the graphite came this sensation of the drift arrested, an aliveness, electricity. When he felt the hook, the fish slipped backward and took a little line. Now we jousted. He ran downstream to the tailout, poised to break into the next chute. Then he ran under the boat both ways and blasted downstream into the rapids. We caught up, conscious of the six-pound line, the weight of the adversary. As we drifted over him he charged back upstream and around a small rock island crested with willows, and into a parallel channel. This fight was over. I pointed the rod at the fish, as if in salute, and the line popped. It was the only time in my life I have broken the line on a steelhead on purpose. I didn't like it. We drifted downstream to the next arena. At the head of a riffle, I pinned a sea-run cutthroat we guessed at about 16 inches before we let it go. This is a river famous for big steelhead that may spawn and return to the ocean several times over their life's span. 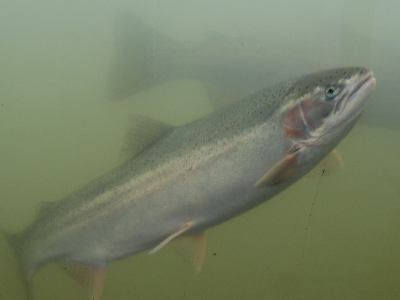 Big steelhead are more likely to win a battle of wits at close quarters. Late in the morning we switched to pink plastic worms, which Palmer says has become his go-to bait when the fish won't touch eggs. Kremers touched a fish right away and then, at straight-up noon, a streak of rainbow-splashed chrome slammed my bait. For five minutes we traded blows and then I guided the eight-pound buck into the shallows. He rubbed the line on the rocks and then began to shake his head. When he charged the boat, he shook the plastic worm right out of his mouth. That didn't feel right either, but it felt more right than staying home when there is chrome in the river and a chance to joust with steelhead in the willows.